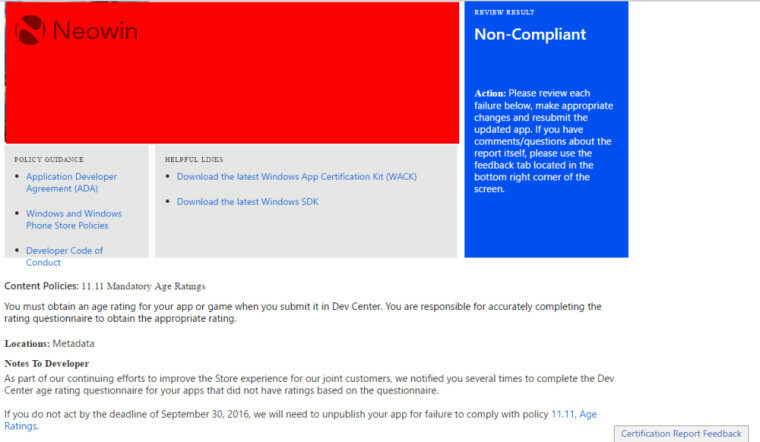 According to an email obtained by Neowin, non-compliant apps will be unpublished and removed from with Windows Store on September 30, 2016, due to failure to comply with policy 11.11, Age Ratings. The email also requests that the developer “remedy the failure” and resubmit the app for approval. Additionally, in another email also obtained by Neowin, Microsoft also highlights the fact that beta (both private and internal) apps will also be required to conform to the age ratings. The age ratings are reportedly set based on the answers to a five-minute questionnaire available in the Dev Center. Regardless, this does draw into question what will happen to the multiple apps which have not been updated or just all out neglected on the Windows Store. Have you noticed the age ratings on the Windos Store?